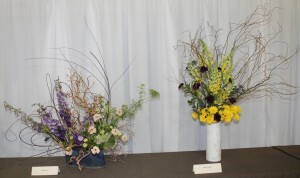 Lovely flower arraignments, called Ikebana, were on displayed in the Barnes Park Gym as part of the 21st Cherry Blossom Festival held on April 21st and 22nd in the city. 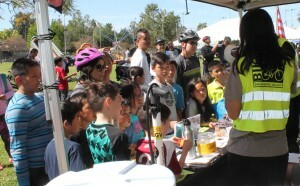 Earth Day was celebrated on April 21st with approximately 150 bike riders traveling around the city as part of the event. 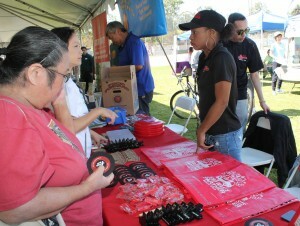 Some lucky riders received door prizes for attending the ride. 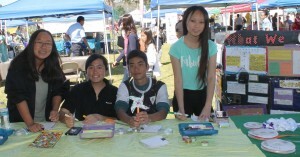 The Earth Day event, celebrated at Barnes Park, featured several booths advising the residents on how to recycle, save water, reduce landfill and save our planet. 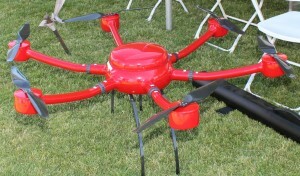 Stanley Lin, President of Planet Save displayed Drones. They are considered the aircraft of the future. 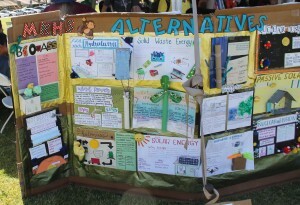 Students from Mark Keppel High School had a booth to show the audience how to recycle household articles and produce art. 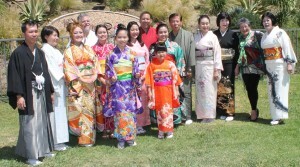 Commissioner Victoria Chavez modeled with members of the L A Kimono Club. They also had a fashion show where Madam Fumi Akuatagawa described the style and use of each of the many kimonos to the guests. 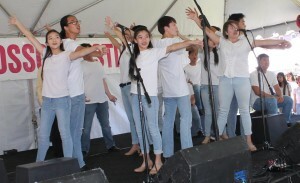 Members of Mark Keppel High School Aztec Singers sang and danced to the delight of the crowd. They opened the Cherry Blossom event on the stage setup in Barnes Park. 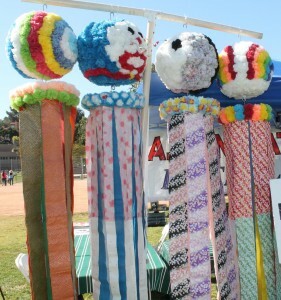 Students from Saga Granada Park United Methodist Church Japanese Language School played the Taiko drums to call all of the residents to enjoy the Cherry Blossom Festival. 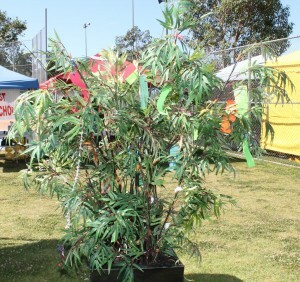 The Los Angeles Tanabata Festival booth features classes on how to make paper flowers and a Wishing Tree. 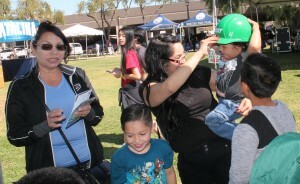 A young firefighter tries on a helmet at the Monterey Park’s Fire Department booth. They also taught Sidewalk CPR to interested residents and handed out important information to everyone. 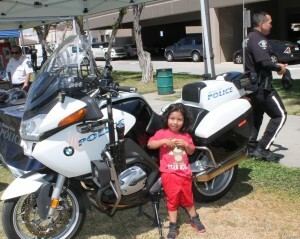 Young police officers enjoyed sitting on one of the Monterey Park’s Police Department motorcycles. They also provided important information to all of the guests. 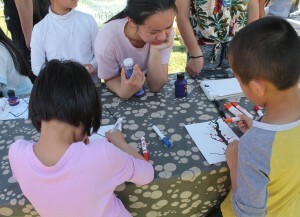 The famous Cherry Blossom trees were created at the Monterey Park Bruggemeyer Library booth as children of all ages blew black ink on paper and drew red or pink blossoms on their trees. Free books were also given to readers at the event. 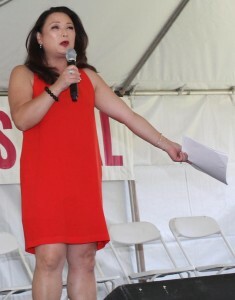 Denise Dador, from ABC 7Eyewitness News Health specialist was the Mistress of Ceremonies at the Grand Opening. She is happy to be here today as she welcomed everyone to the Japanese Cherry Blossom Festival. She welcomed Consul General Akira Chiba to this special event. 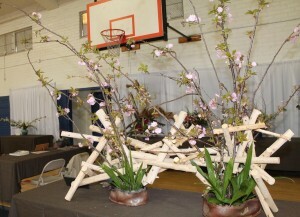 Mr. Chiba stated the Cherry Blossom Festival welcomes spring, friendship and a new start with family celebrations. He recalled the strong ties with the United Stated and Japan. He thanked the city staff, the committee and the residents for this great event. 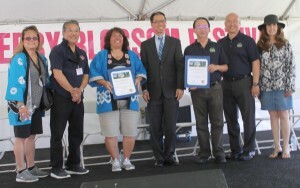 Mayor Pro Tem Peter Chan, Councilmember Hans Liang, Councilmember Teresa Real Sebastian and City Clerk Vince Chang welcomed the residents and their guests to this annual event. 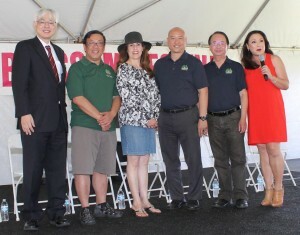 Mayor Stephen Lam was not able to attend since he was visiting one of our sister cities overseas. Councilmember Mitch Ing was not available to attend since he was visiting his ill mother in Canada. Mayor Pro Tem Chan said this event is one of the reasons that Monterey Park is the 3rd best city to live in per Money Magazine. He thanked the staff and committee for their hard work. Please enjoy this event! 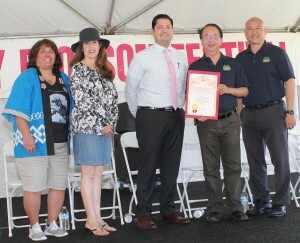 Councilmember Liang welcomed the guests to the Cherry Blossom Festival. Enjoy! Councilmember Real Sebastian welcomed all to this special day. Enjoy yourselves! City Clerk Chang said Good Afternoon! 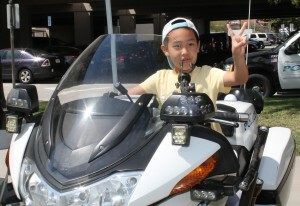 He is dressed in shorts because he participated in the Earth Day Bike Ride. Enjoy the day! Assemblymember Ed Chau said he is happy to be here to celebrate our cultures and heritages. He thanked the staff and volunteers for making the city the 3rd best place to live in because we celebrate all of our cultures. He presented a proclamation to the city and committee for this special event. Florencio Briones, Senior Field Deputy from Supervisor Hilda Solis’ office said she was not able to attend this event but she sends her best wishes to Monterey Park. He presented a proclamation to the city leaders. 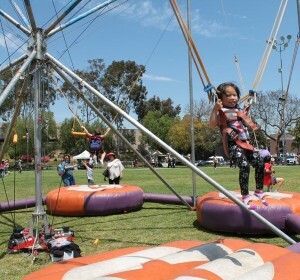 Bob Gin, Vice President of the Alhambra School Board thanked the residents for their support of the children. 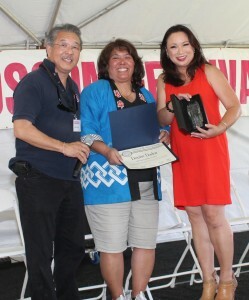 David Ikeda and Karen Ogawa honored Denise Dador for her participation in this event. 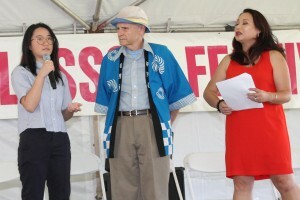 Former Mayor Francisco Alonso, Chair of the Sister Cities Commission, welcomed everyone to the Cherry Blossom Festival. He said the commission foster friendship and exchanges cultures. Every two years student ambassadors visit one of our sister cities and students from the other sister cities visit Monterey Park. We build bridges and not walls. 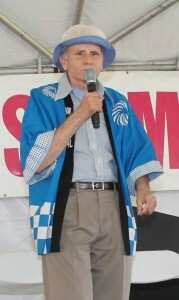 He introduced Crystal, a Student Ambassador to Nachikatsuura. She enjoyed her visit and meeting the residents of her host city. She was shy but answered questions from Denise Dador for the audience. 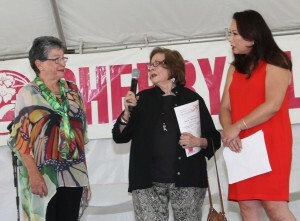 Denise Dador introduced Victoria Chavez and Gloria Enriquez, who represent our sister city Morelia, to the audience. They stated that Morelia is 489 years old and home to a delightful culture. The Monarch butterflies land in the city every year in all of their glory. 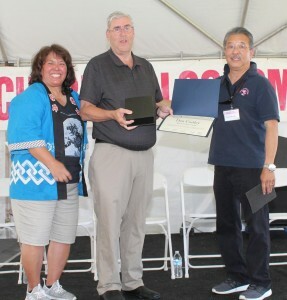 Karen Ogawa and David Ikeda honored Dan Costley, retired Director of Recreation and Community Service, for his 17 years of service to the city and the Cherry Blossom Festival. Mr. Costley thanked the residents and the committee for this honor. This is a reflection on the staff, Council and volunteers. The people always do the work. He thanked the committee for this honor. 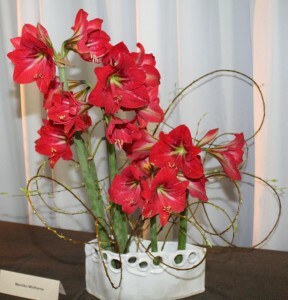 Karen Ogawa and David Ikeda honored Madam Fumi Akuatagawa for her many years of dedication to this event. 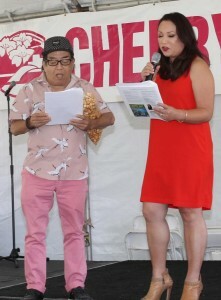 Rodney Kageyama and Denise Dador joined together on stage and suggested that the guests enjoy the many delicious foods and beverages available in the International Food Court. 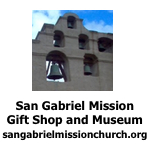 The event featured information booths, gift booths with clothing, leather goods, music, books and more. 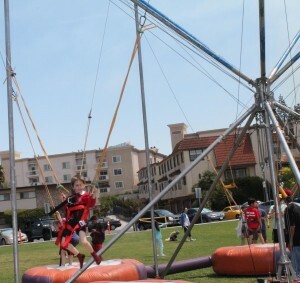 Children enjoyed the Bungee Trampoline and other games in the Game Zone. 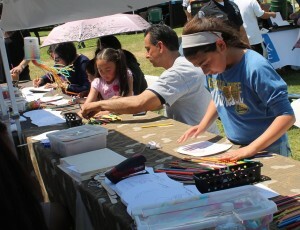 They also colored fans and created other art works. 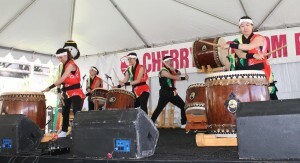 Yoki Daiko or Joyous Drumming from the Tenrikyo Church in Boyle Heights performed several songs as the audience enjoyed the beat of the drums. 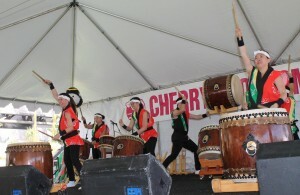 One of the performers stated her brother, another members of the band, made their drums from old whiskey barrels. 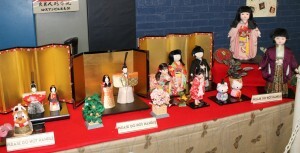 Traditional dolls were on display in the gym as part of the festival. 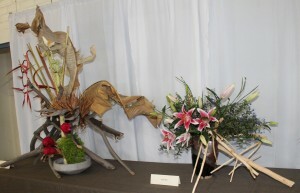 Michael Sanders displayed his famous Origami to the guests. 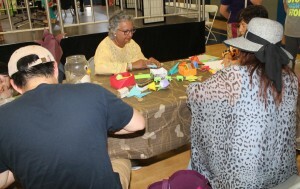 They were also taught how to create their own Origami creatures. 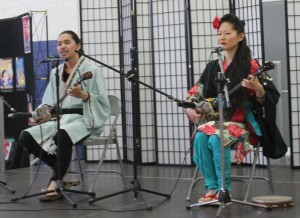 Yuna & Tida created Ryukyuan soul music using the traditional Okinawan 3 string lute known as “Sanshin”. 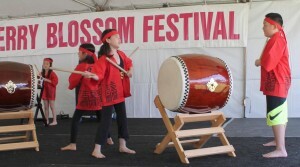 The two-day cultural event featured traditional Japanese folk music, dances, martial arts, tea service and more.